Quickly have all the important PowerShell cmdlets and commands at hand? Why don't you hang them on your office wall? 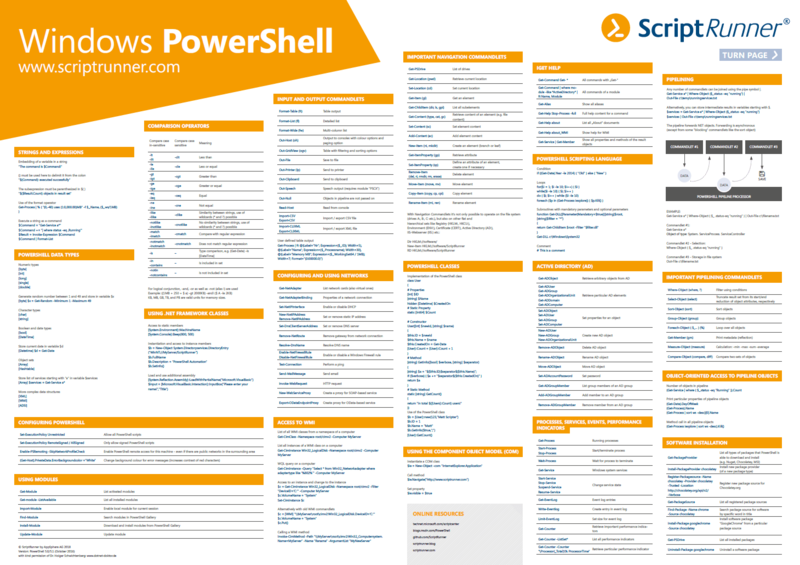 With ScriptRunner's PowerShell poster you can find the most important commands at a glance - that's your help with PowerShell scripting! 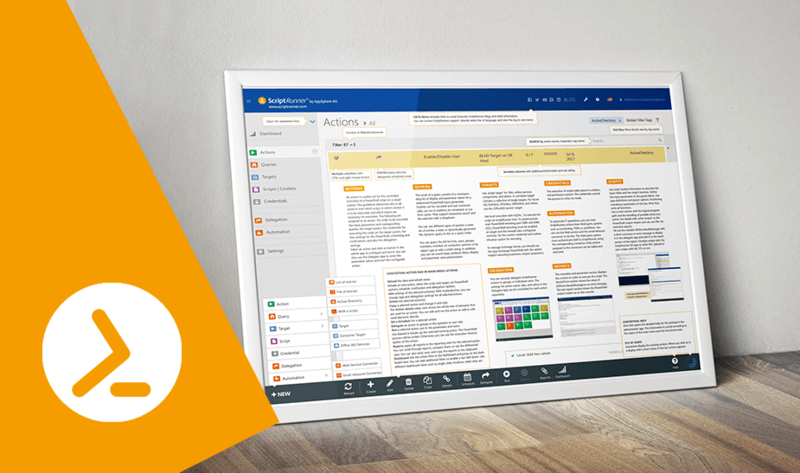 The poster is printed on both sides - on one side the PowerShell commandlets, on the other side the user interface of the ScriptRunner Admin App and the functions are explained. We will send you 2 posters as a package free of charge! The PowerShell page provides an overview of the most important PowerShell commandlets and voice commands. From basic topics, such as the various data types, to cmdlets for Active Directory. From beginners to experts, you'll find useful cmdlets and voice commands here. The ideal support for scripting! You want to automate your PowerShell scripts with ScriptRunner or delegate them securely to others (e.g. HelpDesk)? Then you will find the ScriptRunner Admin App interface on the ScriptRunner page. Here basic elements of the user interface are described and give an insight into the solution. 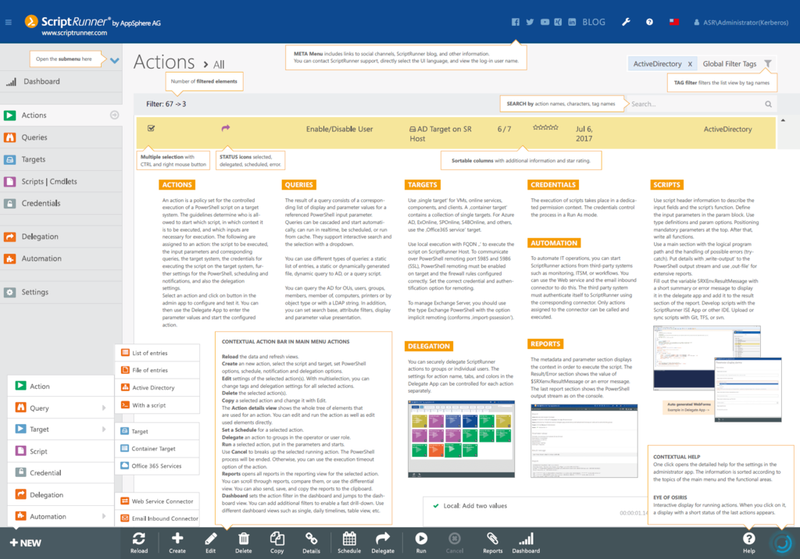 The poster also contains detailed explanations of the various menu items, making ScriptRunner easier to use. Actions: This is a policy defined for the controlled execution of a PowerShell script on a target system. Queries: The result of a query is an associated list of display and parameter values of a referenced PS input parameter. Targets: Single targets are used for VMs, online services and clients, for example. A container target is a collection of single targets. Use the "Office365 Service Target" e.g. for Azure AD, ExOnline etc. Automation: To automate your IT operations, you can start the actions from a third-party system, such as monitoring, ITSM, or workflows. Delegation: You can securely delegate actions to group or individual users, e.g. other administrators, HelpDesk or even end users. Scripts: Use the script header information to describe the input fields and functions of the script. You want to hang the poster in your office? Then please fill in the form. We will also send you an e-mail with a link to download as a PDF file to your e-mail address. The poster is completely free of charge for you, we also take over the shipping costs. Note: Please enter your company data. We do not send the poster to private persons. Thank you for your understanding. Attention: Due to the high demand, shipping may be delayed by a few days!